This episode actually seemed to make the least sense out of the other two that have aired so far. Given each episode is only 24 minutes I’m not sure how I like the progression of relationships in this episode in particular. Upstairs Koma was getting ready to sink her teeth into poor Ken-chan’s neck when she hears the whisper and darts downstairs at the speed of light. She demands to know just what Hayato has done to Sakurako. Her friend says nothing, but Hayato being Hayato asks what hasn’t he done to her. Koma is furious. She warns him away from her friend once more. And again, Hayato being Hayato refuses to listen to her. Sakurako anxiously manages to pull the angry Koma from the room. Meanwhile, Ken goes looking for the girls only to find Aoi who takes his canned crab and trades it for toilet cleaner. Poor boy, looks like Aoi has roped him into doing the toilets for her. The girls get upstairs and Sakurako wonders why Koma is so angry. 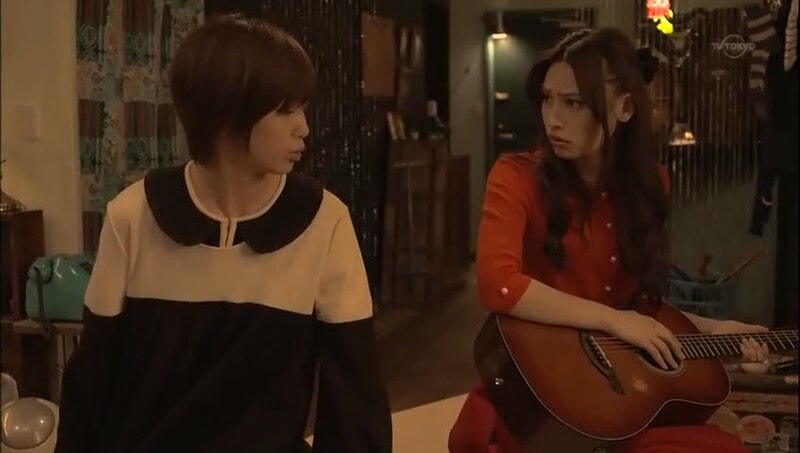 Koma demands she play the guitar and the two girls sit unhappily on the bed. Sakurako plucks a few strings and then demands to know why Koma is angry. Koma says she isn’t, but it is obvious she is. Koma doesn’t like the fact that Sakurako is being drawn in by mere food. Looks like Koma is a bit jealous of Hayato. Aoi enters and tells the girls its getting late. She does not excuse tardiness for work unless its herself. She has the two girls change into maid outfits. Aoi is happy as she believes she chose the right cosplay to attract customers. She mentions there will be ones who fall for the girls and this catches Sakurako’s attention. Aoi then asks who Sakurako loves. Of course, our vampire denies liking any body, but we all know differently. Aoi then goes on to say that both girls need to experience love as it can do so much. Sakurako asks if love can come to a heart that is already dead. Of course. Don’t you know that love transcends time, space, life and death? 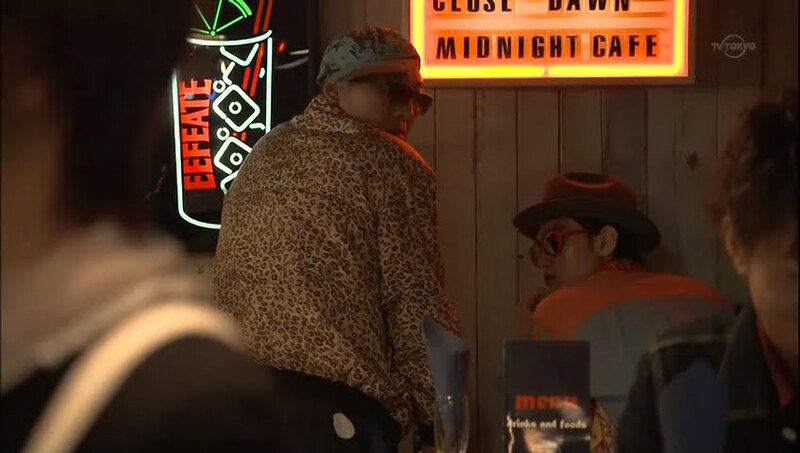 Ken enters the bar where he finds Hayato who asks if Ken works there. Ken says he doesn’t, he just helps out. It must be nice to have that kind of free time. Ken states that he also attends university. He’s a history student, right? How does Hayato know? Aoi complained about how disgusting of a history freak Ken is. LOL. And the poor boy does so much for Aoi. 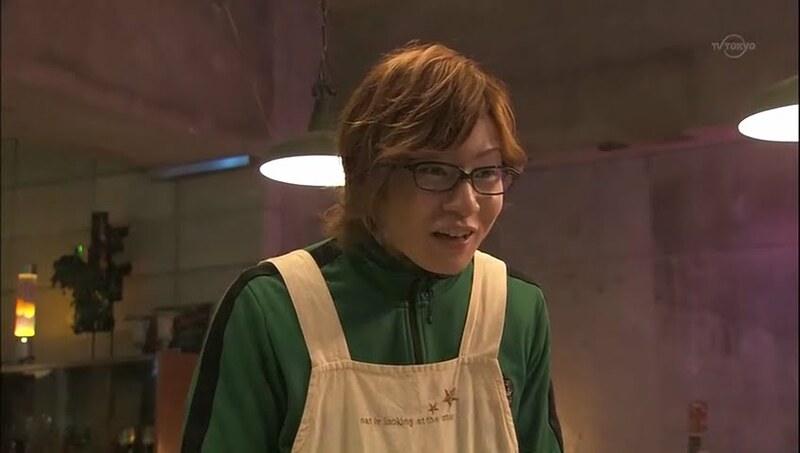 Enter Risa who has made a special cookie for Hayato. We get sappy and sentimental music. 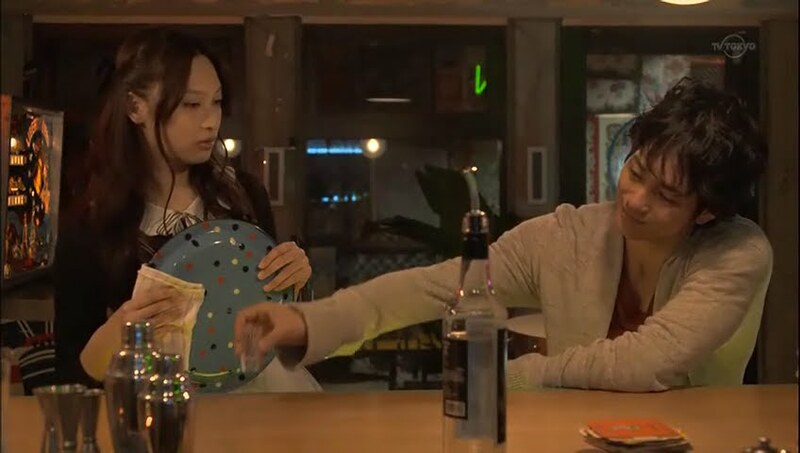 Hayato accepts the cookie and Risa apologizes for what happened with the record company. Hayato smiles and says he was at fault as well. Such a sappy moment. Ken clears his throat. Eh…how long has he been there? Ken says he’s been there the entire time. 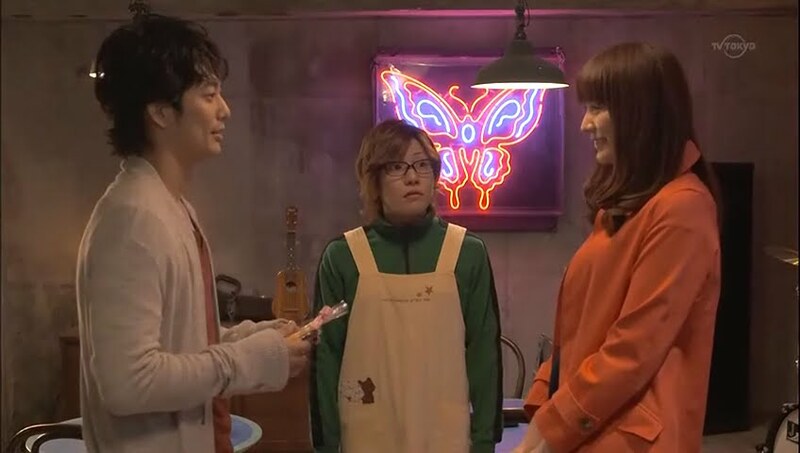 Risa takes off and Hayato gives the cookies to Ken since he can’t handle sweet things. Ken gripes that it seems Hayato disagrees with life. 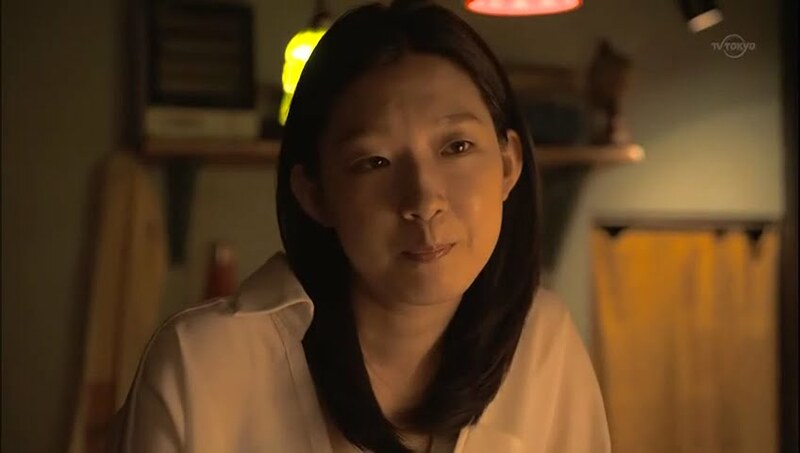 Is Risa is girlfriend? Hayato looks in the direction Risa took and calls her “wallet.” No, she’s not. He doesn’t need her anymore. Hmm. What is Hayato’s story? Ken then wonders why girls like him so much. Hayato says he doesn’t know and puts the cookies in Ken’s pocket. He picks up his electric guitar and sits down. 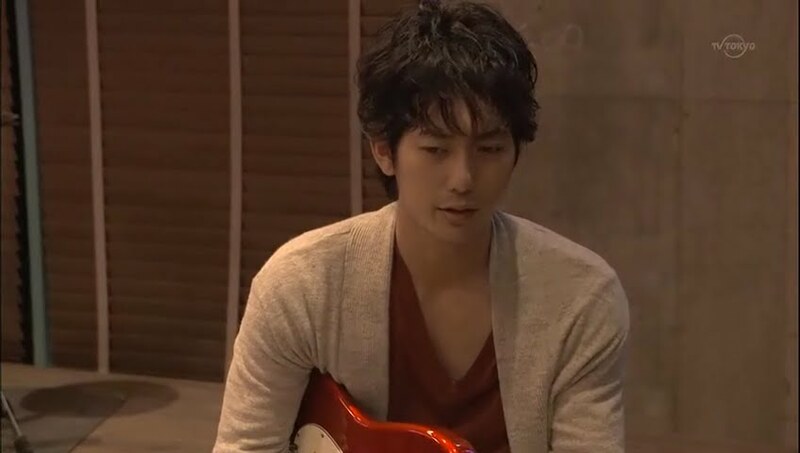 Ken wonders if he should learn and tells Hayato about the guitar Aoi rescued. Hayato says that was his guitar and to throw it away. When Ken goes to negate this, Hayato yells at him to throw it away before switching to a nicer tone to say please. The Midnight Café opens and Aoi encourages the girls to smile. Koma keeps her unhappy face, but Sakurako put on a smile. Aoi asks the reluctant Koma if she wants money. Sakurako pokes her friend and Koma finally forces herself to smile. They then greet the customers as Aoi directed them, too, but something seems off. Ken goes up to Aoi and scolds her for lying to the girls. She couldn’t help it, they are so naïve and believe anything. Sakurako and Koma feel something is a bit off and talk about the human world vs. the vampire world and this is overheard by the Count’s goons. They contact the Count who appears looking down at the bar. What’s the next move? Death is too easy. Sakurako must be tortured for betraying him and then killed. 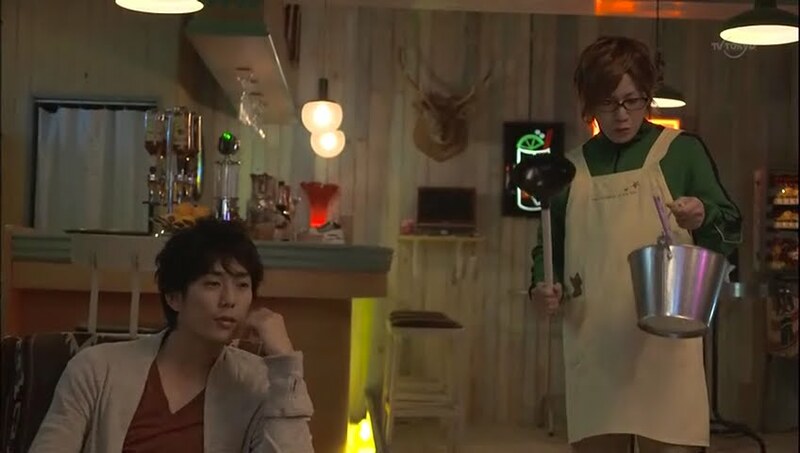 Hayato comes in and sits beside Sakurako who is cleaning a tray. He surprises her by calling her by her first name with no honorifics or anything. He takes a shot and offers her one. Koma immediately jumps in. Didn’t she say NOT to go near Sakurako? And didn’t he say he couldn’t follow that edict? Koma then drinks the shot for Sakurako and almost immediately passes out. What a lightweight. Risa’s friends are none to happy to see the passed out girl fall into Hayato’s lap. Hayato picks her up and asks if she lives nearby. He is surprised to learn the girls live in Ken’s apartment. He tells Sakurako to lead the way. Hayato lays Koma down on the bed and goes to fridge where he gets a bottle of water and a beer. The water is for when Koma wakes up and the beer is for himself. He does say that Koma looks cute when she’s sleeping and not being her usual self. Sakurako chides him and tells him not to say anything bad about her bets friend. Koma is a really fun and sweet girl normally. Sakurako then asks for the beer. Hayato doesn’t wish to hand it over seeing how quickly Koma passed out, but Sakurako grabs it and downs it all. Is she okay? She does a 90 degree bow and is all silly. Hayato spies the guitar and talks about throwing it out. Sakurako immediately grabs it and hugs it to her chest. No! This guitar is precious to her. She then passes out. Hayato looks down at her clutching the guitar in her sleep and smiles. Maybe it’s better off with her after all. Hayato leaves and some time later the two girls wake up. They are strangely thirsty. Enter Ken. He sees their smiles and notices their fangs. He immediately tries to leave the apartment, but they drag him back and throw him against the bed. What will they do? We’ll have to wait until next time. Again, Hayato’s actions are soooo mixed up. I’m not sure just what kind of guy he is and if he really likes Sakurako or not. The next episode does promise to have some cute scenes in it. I have no idea what Hayato is thinking, ever. His character is so…so…odd. 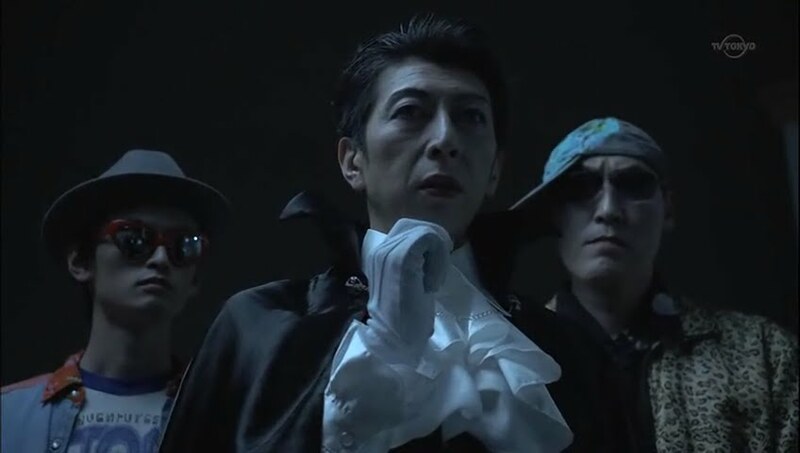 All the other characters are rather easy to understand & transparent & then we get Mr. Moody Musician who is hot & cold & has something in his past, but what that is we don’t know. Makes it hard for me to understand why the girls love him. You know what it’s like? It’s as if the writer has said “this character is the generic broody musician” but then not written anything else for his character. So the actor is just like, “well, i’ll just act like this for a while then”. That’s how little he actually makes sense. It’s just bad writing.